Lorraine Huber belongs to one of the most experienced and qualified female big mountain skiers in Europe. Since 2004, Lorraine Huber has worked as a guide and directed freeride camps for men and women of all skill levels. She was the first woman in Austria to complete her Level III ski and snowboard instructor courses (staatlich geprüfter Skilehrer/Diplomsnowboardlehrer). A year later, during 2003, she went on to complete the ski mountain guide course (staatl. gepr. Skiführer) and co-founded the Freeride Center Sölden, Austria, which she ran until 2007. Lorraine’s experience in creating and coaching freeride programs also flowed into the establishment of the Kästle Adventure Tours, a collection of unique freeride trips in Europe and Canada. 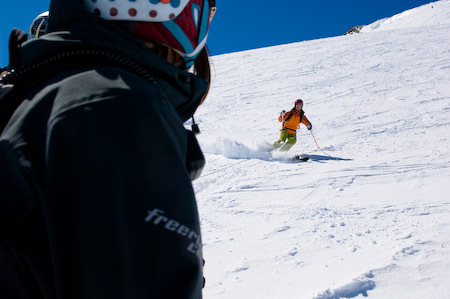 Lorraine will be directing a Women’s Freeride Camp again in 2014 in Lech am Arlberg, click here for more information. Hi Jane, it’s so lovely to hear from you! You know I remember Henry and Robert, they were some of my first pupils, and so well mannered! To hear that they sill love skiing and are in the top ski group is just so great! Thank you so much for letting me know 🙂 Say hi to them from me!